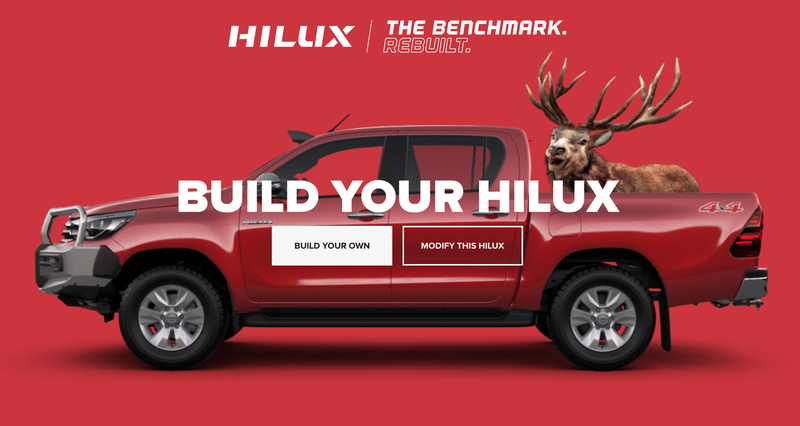 Toyota New Zealand is promoting the Toyota Hilux ute with the Toyota Ode to Hilux, an advertising campaign featuring ducks, fish, deer, wild goats (tahr), opossums, crayfish and whitebait, all keen to get their ride on the legendary off-road vehicle. 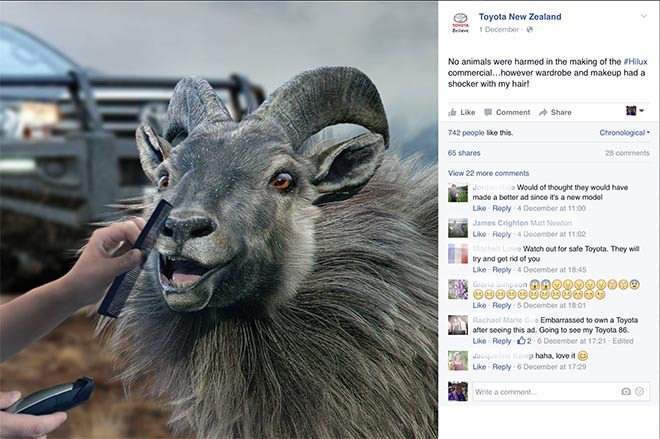 Shot on location in the Rees Valley (at the head of Lake Wakatipu) and other NZ locations, the Call of the Wild commercial presents a poem narrated by animals happy to be shot, caught and carried by Toyota Hilux-driving hunters and fishers. The campaign also introduces a fresh brand positioning for Hilux which will appear across all elements of the advertising: “The All New Hilux. The Benchmark. 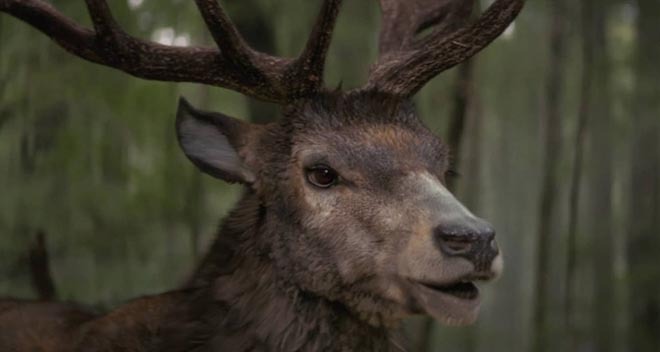 Rebuilt.” Despite all creatures in the ad being generated through CGI, public responses have been predictably divided between amused and horrified. The Toyota Ode to Hilux commercial and associated clips has been withdrawn from the Toyota YouTube channel in response to complaints. OH JOY! To be upon the new Hilux, transported. We’ll not be hunted – but happily courted! mounted up proudly on your mighty steel bonnet! Your sweet engine purrs, refusing to fail. carry us with pride to the local taxidermist! We’ll embrace our destiny – flattened without fuss! Hunters, grunters and punters rejoice! All the wildebeests and Sunday feasts yell out CHOICE! It’s an honour to be transported into a piping hot fritter! the big boat tuggers, lovers of rugger, and wild piggers! The benchmark is back! Rebuilt to be a winner! Raise a glass to the legend – while you have us for dinner! 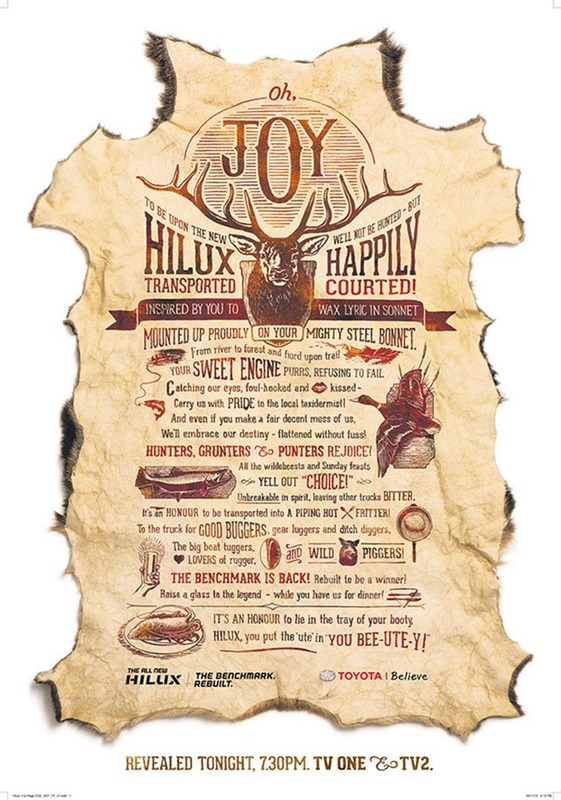 The Toyota Ode To Hilux campaign was developed at Saatchi & Saatchi NZ by executive creative directors Guy Roberts and Corey Chalmers, designers Rob Flynn and Ross Davies, illustrator Tomas Cottle, executive producer Anna Kennedy, CEO Nicky Bell, general manager Paul Wilson, business director Susie Darling, director of strategy Murray Streets, senior account manager Amanda Brittain, working with Toyota NZ CEO Alistair Davis, general manager UV and marketing Andrew Davis and assistant marketing manager Susanne Hardy. Filming was shot by director Adam Stevens via Robber’s Dog with executive producer Mark Foster, managing director George Mackenzie, producer Helen Hendry, and director of photography Shelley Farthing-Dawe. Editor was Stewart Reeves at Rock Paper Scissors. Visual effects were produced at Alt.vfx by VFX supervisor Colin Henshaw and executive producer Kate Stenhouse. Sound was designed at The Coopers. Music was composed by Elliott Wheeler at Turning Studios. Photography by Ross Brown at Match Photography was retouched by Andy Salisbury at Cake.